The “French Dip” is Southern California’s entry in the Best Sandwich on the Planet derby. Never mind that the original was neither French, nor dipped by the diner (it was doused back in the kitchen), this hot sandwich of thinly sliced roast beef on a baguette served au jus (with beef juices, broth or consommé) became a staple of diners, dining halls and mid-century school cafeterias. The version at Rubicon Deli (3715 India Street, Mission Hills), the Dapper Dipper, may be the best I’ve tasted. 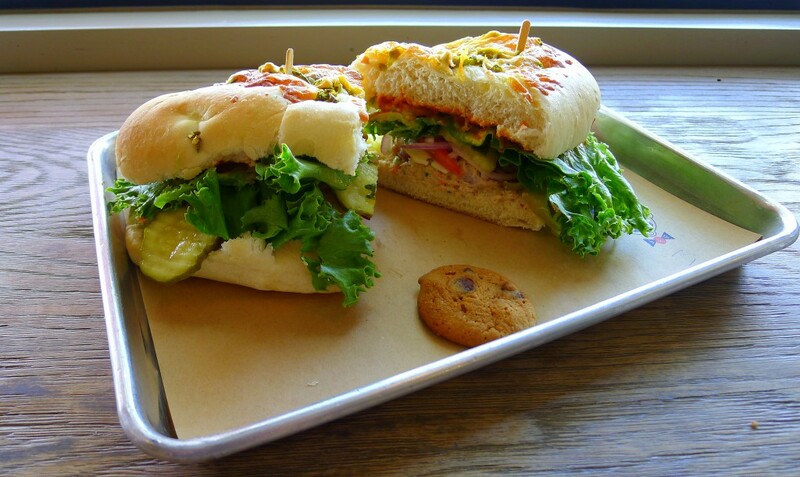 All of Rubicon’s sandwiches start with a choice of six house-baked breads. The best for the Dapper Dipper is the Dutch Crunch, the exterior of which holds up well to the dipping. The beef in the sandwich is a half-pound of slow-roasted tri-tip, another Southern California original. But what makes the dish is how the creamy horseradish, Swiss cheese, beef and the au jus marry. Each of the parts is quality; the whole is greater than that. 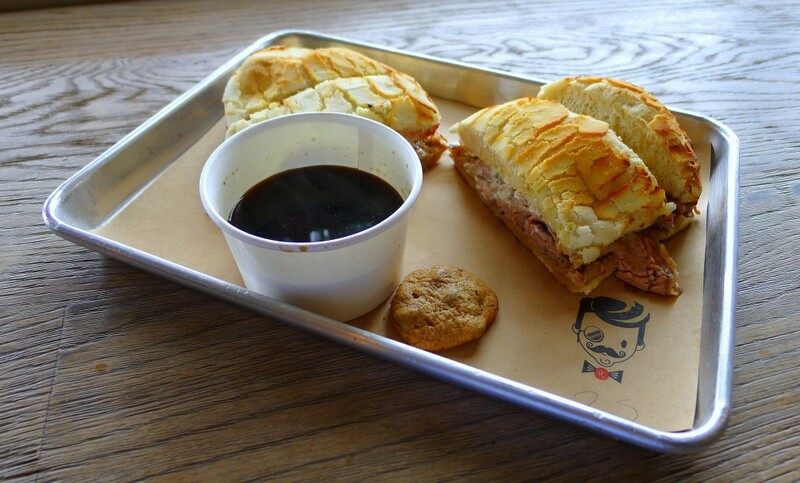 It is the French Dip taken to its logical extreme. The French Dip’s origin is sharply disputed. Two Los Angeles restaurants claim the invention: Cole’s Pacific Electric Buffet and Philippe The Original, the latter including the words “Home Of The Original French Dip Sandwich” in its logo. The origin stories range from a sandwich accidentally falling into a pan of meat drippings, a thrifty customer (or cook) finding a use for otherwise un-used drippings, to a chef softening bread in the juice for a customer with sore gums. While the truth may never be known, my money’s on a chef-owner covering up stale bread. Ironically, the Dapper Dipper may be Rubicon’s least creative offering. The spicy tuna sandwich, like most of Rubicon’s offerings, is a creative play on a classic. This, however, wasn’t your ex-girlfriend’s fool-yourself-into-thinking-you’re-dieting tuna sandwich. How could it be with habañero mustard and a jalapeño jack loaf? These kicked-up ingredients provide the fireworks. But what really makes it work, as with the Dapper Dipper, is how those ingredients work hand-in-hand with more traditional ingredients: good quality albacore tuna, onion, pickle and pepperoncinis. Iím not one who goes for goopy sandwiches, but I’m definitely one who goes for this. In the Dapper Dipper’s absence, the spicy tuna might be a Best Sandwich on the Planet candidate. Less adequate was the Rubicon special. Usually, the namesake dish is a highlight. This turkey, smoked gouda and roasted red pepper sandwich fell flat. Somehow the red pepper ended up sucking the life out of the smoked gouda, and the top quality of the turkey meat couldn’t shine through. The Dom Pastram was much better, a wonderfully fresh cabbage coleslaw elevating the sandwich beyond the classic on which it riffed. One word on volume: Rubicon’s sandwiches are huge. There’s a reason for that take-home wrapping station at the exit. A half sandwich is more than enough. And when it comes to the Dapper Dipper, size creates another irony—just try not to get some of that delicious au jus-horseradish ooze on your threads. You just can’t look too dapper after dipping that behemoth.